Growing your own garlic at home is healthier and cheaper than buying garlic from the supermarket. Garlic is very easy to grow yourself and it thrives outdoors or indoors with plenty of sun and a little care and attention. Planting and growing garlic can give you an endless supply of this health-boosting plant to use in cooking and home remedies. Garlic is a member of the same family as onions, leeks, and chives and it can be eaten raw or cooked. Apart from being a delicious addition to many meals, you should eat more garlic because of its many therapeutic properties. Garlic is known to prevent colds, help keep your heart healthy, and is a natural antibiotic. One reason to grow your own garlic is that much of the garlic sold in supermarkets is treated with chemicals to stop them sprouting. So, when looking for the best type of garlic to grow yourself, you should always buy organic garlic to plant. 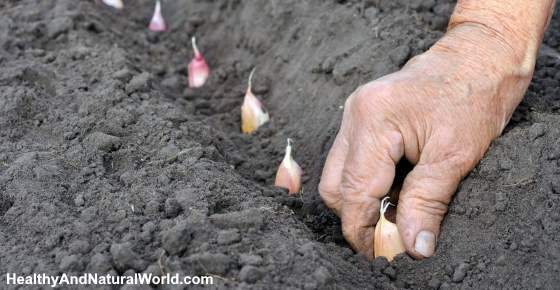 In this step-by-step guide, you will find how to grow garlic and get the best tips to ensure a bumper crop. First of all, let’s look at a few reasons why you should use more garlic in your diet. Garlic contains a compound called allicin. This is a sulfur compound which gives garlic its strong smell and many of its health benefits. Later in the article, you can read in more depth about the reasons to eat more garlic in your diet. Let’s look at how to grow garlic in your garden or in containers indoors. All you need to start growing your own garlic are a few organic garlic cloves. You can start by buying a couple of bulbs of garlic from a local farmer’s market, plant nursery, or online. Garlic bought in the supermarket isn’t suitable for growing your own because it has probably been treated with chemicals to hinder growth. Softneck garlic. Softneck varieties of garlic produce large bulbs with up to 20 cloves. Softneck garlic grows well in warmer climates or where winters are milder. Some excellent varieties of softneck garlic are “Persian star”, “Mother of Pearl”, or “Red Toch”. Hardneck (stiffneck) garlic. Varieties of hardneck garlic tend to grow well in colder climates. They tend to have a less pungent taste than softneck garlic but don’t keep as long as softneck. Some types of hardneck garlic you can grow at home are “Carpathian”, “Spanish Roja”, or “German White”. When choosing which type of garlic to grow at home, choose either the softneck varieties if you live in a warm climate or the hardneck variety if you are in colder climates. You should buy whole garlic bulbs from a garden center or plant nursery. Garlic needs fertile soil to grow well and requires adequate levels of nitrogen. Break up the bulb into individual cloves but don’t peel them. Bury the cloves about 2 inches (5cm) deep and keep the cloves about 4-6 inches (10cm – 15cm) apart. The garlic clove should be planted with the pointed end facing up. Fill in the holes with soil and water well. If you live in colder climates, you should cover the area with mulch or straw to protect the growing garlic during wintertime. Once the threat of frost has passed, you can remove the mulch. In the springtime, some garlic varieties produce flower shoots emerging from the soil. They look like little bulbs atop the flower stalk. Cut these off, otherwise, the garlic bulbs won’t grow as large. The only care that garlic needs while growing is to remove any weeds and water occasionally during dry spells. During May and June in the Northern hemisphere (November and December in the Southern hemisphere), garlic needs to be well-watered. It is during these months that the bulbs form in the ground. You don’t need to water garlic too much at other times unless the weather is dry and hot. During the growth periods, you should feed garlic every four weeks. This will help to give the garlic the needed nutrients so that the bulbs grow as large as possible. You should use a natural fertilizer with high nitrogen levels. So, look for fertilizers containing dolomite, blood and bone compounds, or sheep manure to boost healthy garlic growth. Garlic is ready for harvesting in the summertime when the stalks have turned brown. When harvesting garlic, you shouldn’t pull them up by the stalks. Take a garden fork or spade and carefully dig them up, taking care not to bruise them. To store garlic, you need to let the whole bulbs dry. To dry garlic for storage, leave them in a shady area with good air circulation for around 2 weeks. During this time, make sure that the garlic bulbs don’t get wet and don’t break the bulbs apart. You know when the bulbs have dried adequately when the root crown is hard and you can easily separate the cloves. However, your freshly-grown garlic is suitable for eating and adding to dishes as soon as you take it out the ground. Depending on the type of garlic, you can store garlic bulbs between 4 and 8 months. Hardneck varieties of garlic usually keep for between 4 and 6 months and softneck garlic will keep for about 8 months. To store garlic properly, you should leave the papery outer wrappers on and keep the bulbs intact. For hardneck garlic types, you should trim off the stems about 2cm from the top of the bulb. Store these in mesh bags to allow the air to circulate around them. You can braid the stems of softneck garlic and hang in a cool, dry place. Garlic is a very hardy plant which is easy to grow and it is a natural pest repellent. However, there are a few common problems when growing garlic. Birds can pick at the buds and leaves of garlic which can destroy them. To prevent birds damaging your garlic, cover the plant with horticultural mesh. The Royal Horticultural Society says that soil-borne fungi can cause garlic bulbs to rot. The visible signs of white rot in garlic are yellowing and wilting stems. The garlic will also show signs of fungus around the base of the bulb.3 Leek rust (which also affects garlic) will cause bright yellow spots on the leaves and humidity can aggravate the problem. Growing garlic indoors is an excellent way to have an all-year supply of garlic. It also helps to prevent pests and fungal infections harming your garlic yield. All you need is a suitable container, plenty of sunlight, and a little care and attention. Your pot should be at least 8 inches (20cm) deep with holes for drainage. If you want to plant more than one clove in a pot, you need a container large enough to leave 4 inches (10 cm) between cloves. Place the container in a place that gets lots of sunshine. While the garlic is growing, you need to make sure that the soil is moist. The frequency of watering your garlic depends on the temperature of your home and the amount of sunshine the garlic gets. As with growing garlic outdoors, you should cut off flowers that start to grow. This will help to maximize the size of the garlic bulb. Now that you know how easy it is to grow your own garlic, what are some of the health benefits of incorporating more garlic in your diet? Here are some of the proven ways that garlic can boost your health. When using garlic for treating infections and improving your overall health, you should use fresh, crushed garlic. Always leave the crushed garlic for 10 minutes at room temperature for the allicin and other medicinal compounds to form properly. Garlic can also help to treat chest infections naturally and clear up respiratory problems associated with the common cold and flu viruses. You should use fresh garlic for the best medicinal properties. For example, you can mix some crushed garlic with a tablespoon of coconut oil to combat bacterial skin infections naturally. To find out how to properly use garlic medicinally, please read my article about the 6 common mistakes to avoid when using garlic as an antibiotic. For example, you can mix coconut oil with crushed garlic as a natural treatment for ringworm. Or if you have a yeast infection, consume more garlic in your diet to kill of the infection. In fact, garlic is one of the best foods to keep your heart healthy. J Antimicrob Chemother. 2003 Dec;52(6):974-80. Nutr J. 2002; 1: 4. J Ayub Med Coll Abbottabad. 2005 Jul-Sep;17(3):60-4.